Koumajou Densetsu es un juego desarrollado por Frontier Aja mejor conocido por bajo mundo del fandom como Touhouvania, y es como su nombre lo indica un juego parodia del clasico Castelvania, donde tendras que enfrentarte a diversos personajes de la franquicia de Touhou, el juego se mueve en pantallas plataformeras verticales y los jefes al igual que en muchos otros juegos disparan danmaku de forma indiscriminada, en este caso la musica corre a cargo de Eiichiro Yanagi. CD 1> 01. 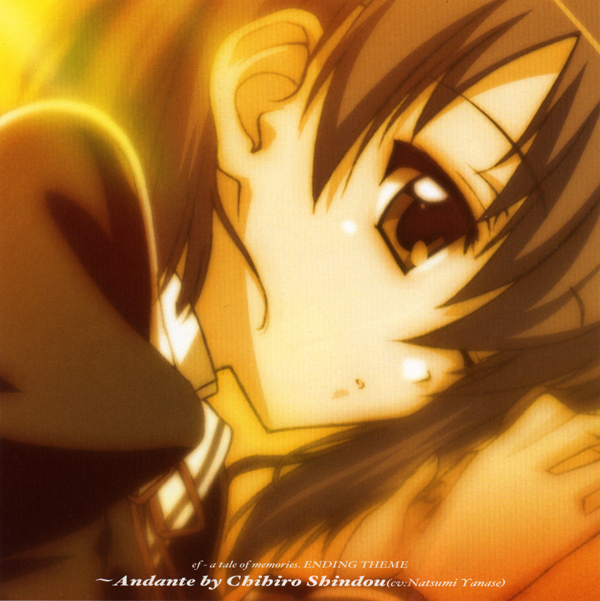 Kimisome no Amnesia -Ex Violin Version- (4:05), 02. Kimisome no Amnesia -Ex Violin Version- [Instrumental] (4:05), 03. 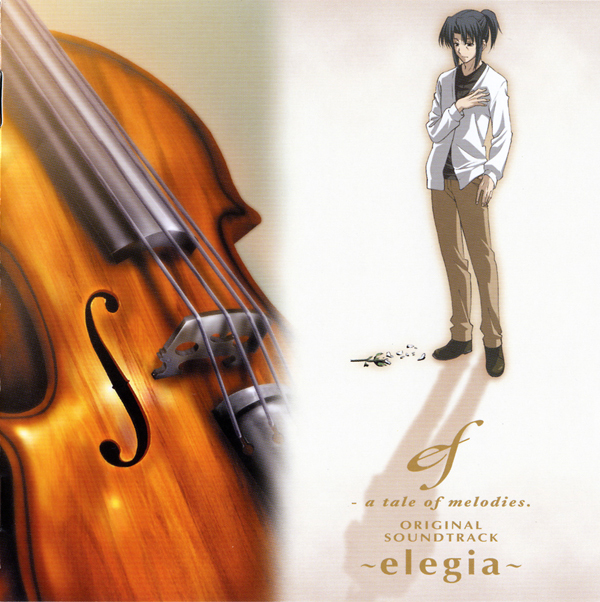 Kimisome no Amnesia -Ex Violin Version- [Short Version] (1:48), 04. 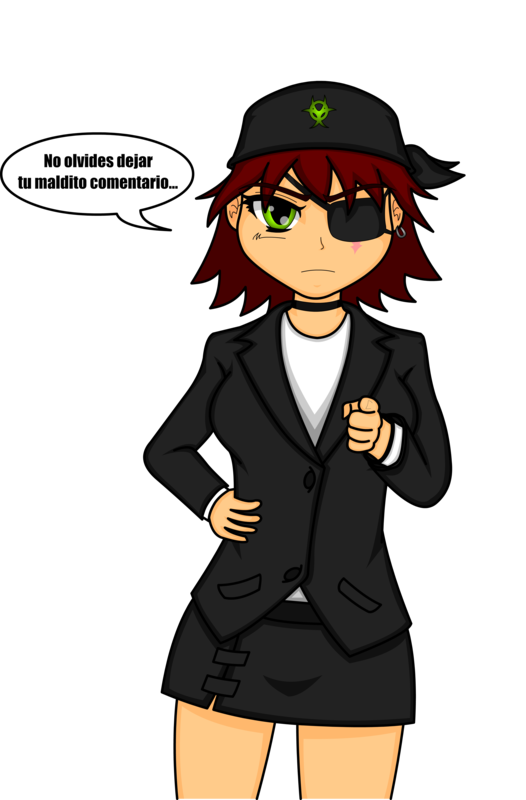 Kimisome no Amnesia -Original Version- (4:05), 05. Kimisome no Amnesia -Original Version- [Short Version] (1:46). CD 2> 01. Gensokyo Overture [Stage 1] (3:49), 02. Freeze Breeze [vs Cirno] (3:27), 03. The Lost Forest [Stage 2] (2:50), 04. Dragon Girl [vs Meirin] (2:39), 05. Divine Shrine Maiden [Stage 3] (3:20), 06. Menace [vs Sakuya1] (2:18), 07. Dollhouse [Stage 4] (4:00), 08. Prism Heart [vs Alice] (3:37), 09. Battle Field [Stage 5] (3:39), 10. The Moon, a Piano, and a Veritable Pandemonium [vs Suika] (3:28), 11. Maze of Knowledge [Stage 6] (3:13), 12. Wizard of the End [vs Patchouli] (4:50), 13. Scarlet Tears [Stage 7] (3:40), 14. Clockwork Doll [vs Sakuya2] (4:09), 15. Silence [Stage 8] (1:56), 16. Castle Lord of Heartwarming Crimson [vs Remilia] (4:31), 17. Intoxicated on High-quality Sake [Ending] (3:25), 18. Stage Clear (0:13), 19. Game Over (0:10), 20. Legend of the Scarlet Devil Castle [Unused Track] (2:56), 21. Full Moon Duel [Stage EX] (3:46), 22. Chains on my Right Hand, Madness in my Left Hand [vs Flandre] (5:10). CD 1> 01. Afraid [Theme Song] (4:51), 02. Prorogue (3:55), 03. A Night… [Pertner Select] (2:55), 04. Clockwork Doll -Killer Maid Style- [Stage 1] (2:05), 05. Prism Heart -SR Style- [vs Alice] (2:29), 06. 麗しき紅の城主 -Style of Bloody Destiny- [Stage 2] (3:02), 07. Cat Blast! [vs Chen] (2:23), 08. Grave Cave [Stage 3] (3:43), 09. 桜花一閃 [vs Youmu] (2:38), 10. 奪われた大図書館 [Stage 4] (1:54), 11. 魔弾の流星 -Star Wizard- [vs Marisa] (2:10), 12. Ghost Scimitar [Stage 5] (2:08), 13. 乾坤の巫女 -Orchestral Style- [vs Reimu] (2:29), 14. Scarlet Tears -SR Style- [Stage 6] (3:45), 15. 倒錯する狂気 [vs Ran] (1:48), 16. 絆を胸に [Stage 7] (3:46), 17. 口寄せる骸 [vs Yuyuko] (2:09), 18. 静寂 -SR Style- [Stage 8] (1:41), 19. 霧染のアムネイジア -Orchestral Style- [vs Remilia] (3:15), 20. 薔薇殺しのカーミラ [vs Yougen Remilia] (5:30). CD 2> 01. Afraid -Evening Style- [Omake] (4:00), 02. Scarlet Tears -Afternoon Style- [Omake] (2:27), 03. Izayoi [Stage Ph] (4:17), 04. Last Phantasm [vs Yukari] (3:31), 05. 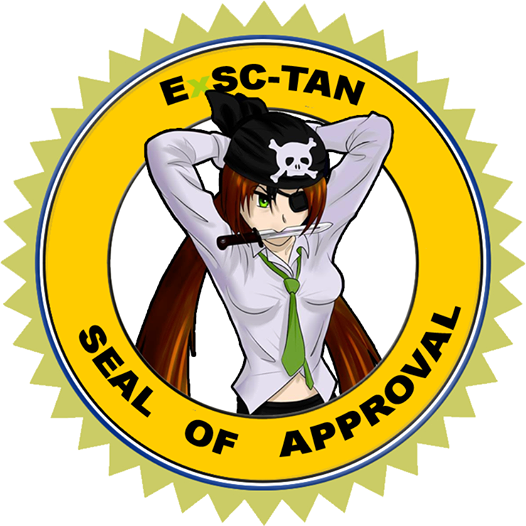 Fatal Bile [Endhing Theme Song] (4:55), 06. 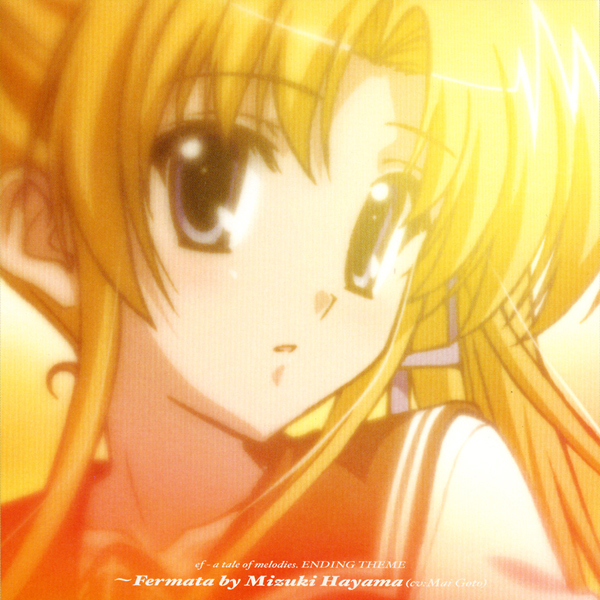 紫焉 Ending Theme Song- [Stage Ph] (4:57), 07. Afraid [Short Edit] (2:01), 08. Afraid [Instrumental] (4:51), 09. 薔薇殺しのカーミラ [Instrumental] (5:32), 10. Fatal Bite [Instrumental] (4:55), 11. 紫焉 [Instrumental] (4:55). 01. Less than 45sec (1:59), 02. Holy day (2:07), 03. Church’s bell (2:49), 04. Meets girl (1:28), 05. Snowly star (3:05), 06. A sheep as for lamb (3:51), 07. Hiroko Taguchi – I’m here [TV Version I] (1:32), 08. Single line (1:55), 09. Unattended Station (2:01), 10. Handing over (2:26), 11. Stay with… (1:54), 12. Euphoric night (2:04), 13. Junko Okada – Kizamu Kisetsu [TV Version I] (1:34), 14. Every morning (1:50), 15. A moon filled sky ARmix (2:47), 16. Free and easy ARmix (3:01), 17. Promise (2:14), 18. Secret story (2:48), 19. The diary (1:55), 20. Sorrowful feather C2Rmix (3:47), 21. Impulsive step (2:08), 22. 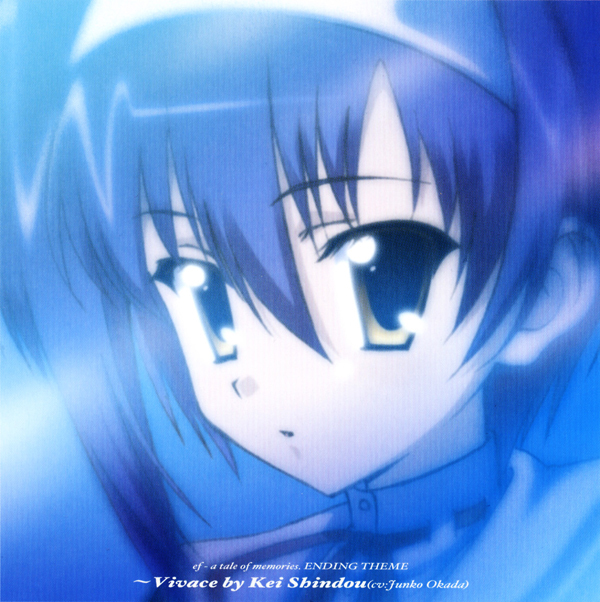 Natsumi Yanase – Sora no Yume [TV Version I] (1:32), 23. Junior girl ARmix (1:56), 24. Shiny walking (2:42), 25. Deep thinking (2:29), 26. Unexpected (1:50), 27. Early days (2:08), 28. Bad friend ARmix (2:06), 29. Mistake (1:12), 30. Early Childhood ARmix (2:45), 31. Elisa – Euphoric Field [TV Version – English] (1:30). 01. Elisa – Euphoric Field [TV Version – Japanese] (1:32), 02. C2R Emotion (3:12), 03. Sepia Film (2:18), 04. In the Living Room (1:39), 05. Existence (2:50), 06. Steps Forward by One Step (1:50), 07. Miniature Garden (2:04), 08. Agent (0:33), 09. Ideal and Reality (1:29), 10. Shot (1:45), 11. Allegory (1:56), 12. I… (3:22), 13. Hiroko Taguchi – I’m Here [TV Version II] (1:33), 14. Lost Memory (2:48), 15. Clear Night (2:04), 16. Forget me Not (1:25), 17. True feelings (4:01), 18. Junko Okada – Kizamu Kisetsu [TV Version II] (1:34), 19. Countdown (4:44), 20. Only Two (3:48), 21. The Final Chapter (2:42), 22. Terminal Dtation (4:22), 23. 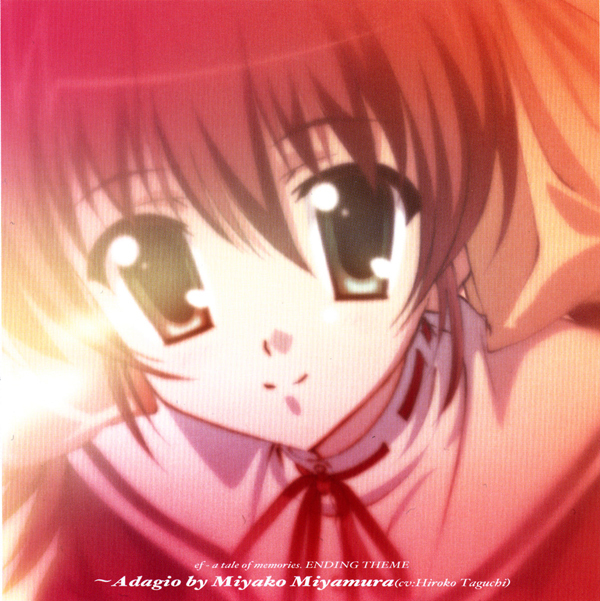 Natsumi Yanase – Sora no Yume [TV Version II] (1:32), 24. From Yesterday to Today (1:48), 25. Knight (1:07), 26. Desire that Doesn’t Want to Forget (1:39), 27. Start and Stay With (6:09), 28. Yumiko Nakajima – Yuukyuu no Tsubasa (4:38). 01. Overture (4:22), 02. Elisa – Ebullient Future [TV Version] (1:37), 03. A Moon Filled Sky (2:49), 04. The Other Side of Mask (0:36), 05. Dissembles (2:16), 06. Seperate Way (4:28), 07. Answer of Asking Oneself (1:28), 08. Embarrassed (0:32), 09. Still Alive (1:31), 10. Scary (0:41), 11. Determined Herself (1:32), 12. Because, He is Here. (2:37), 13. Who’s Problem (0:58), 14. Abnormal Smile (0:24), 15. Twins, Seperate Place (3:33), 16. Two Standpoints (1:03), 17. Evening Calm (1:42), 18. Confession (3:35), 19. A Girl Whom you Deserted (0:19), 20. Yumiko Nakajima – Negai no Kakera [TV Version I] (1:33), 21. Entropy (1:10), 22. Small Revenge (2:01), 23. Kill and Come (3:49), 24. Why? Why? Why? (3:00), 25. Gotou Mai – Egao no Chikara [TV Version] (1:29). 01. Selfish Proposal (0:54), 02. Elisa – Ebullient Future [TV Version English] (1:35), 03. New town, Old town (1:46), 04. Believes, or doubts (1:31), 05. Lights (1:53), 06. Sedition (2:04), 07. Dependence (1:34), 08. Yumiko Nakajima – Negai no Kakera [TV Version II] (1:33), 09. Collapsing feelings (2:31), 10. It returns to the dark (3:11), 11. Bluffs regret (1:56), 12. Wall of ice (1:58), 13. Fragility and scary (0:56), 14. Hand of light (0:28), 15. Nonchalant happiness (2:23), 16. The wished world (1:31), 17. The past and the future (2:17), 18. Angel’s stairs IE mix (1:22), 19. 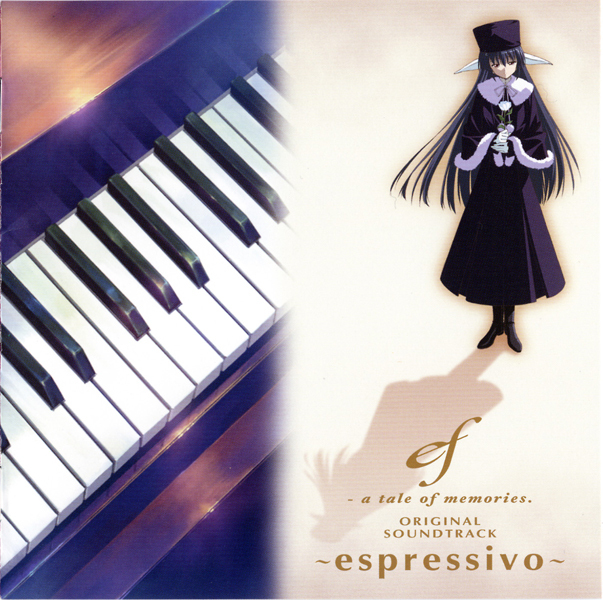 Elisa – Ebullient Future [Piano Version] (1:31), 20. It starts here (1:34), 21. First step that realizes dream (1:43), 22. Painful notification (1:20), 23. Two courages (1:00), 24. The smile is bet (1:49), 25. Gotou Mai – Egao no Chikara [TV Version II] (1:32), 26. Uneasy time (0:45), 27. Two are brought together (1:05), 28. Gotou Mai – A moon filled sky (6:54), 29. In front of the grave (0:50), 30. Watches it from the sky (1:11), 31. The place promised (0:58), 32. Two becomes one (1:01), 33. It through all eternity (5:18), 34. 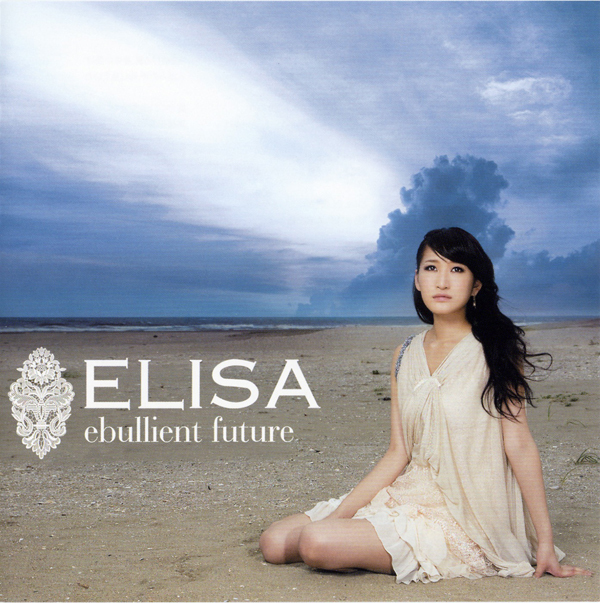 Elisa – Ebullient Future [TV Version Japanese] (2:37), 35. Ever Forever [OG mix] (1:50). Disco I: 01. Two, Only Two (3:53), 02. Hitomi Harada – Eternal Feather (5:00), 03. Snowly Night (2:03), 04. Church (2:26), 05. Mysteric Position (1:43), 06. Dreaming Dreaming (3:02), 07. Over Night (2:03), 08. A Moon Filled Sky (2:49), 09. Imagination (2:47), 10. Morning Air (1:47), 11. Early Childhood (2:48), 12. Junior Girl (1:47), 13. Bad Friend (2:05), 14. Free and Easy (3:00), 15. Twilight (2:01), 16. A Wish (2:04), 17. Sorrowful Feather (2:05), 18. Silent Talk (1:52), 19. Eye Level (2:02), 20. Hit Hit Hit (1:21), 21. Boisterous (1:11), 22. Hand with Hand (1:16), 23. Walk Around (2:31), 24. Heart to Heart (1:43), 25. Frailty Feather (2:04), 26. Tear (2:08), 27. Start Again (1:38), 28. Warm Color (2:09), 29. Genuine (1:15). Disco II: 01. Good-bye my Friend (1:30), 02. Adult Room (2:34), 03. Stroll of Puppy (4:02), 04. Angel’s Smile (2:26), 05. Happy Summer Vacation (1:46), 06. Soft Ice Cream!! (2:04), 07. Towering Cloud in Summer (2:42), 08. Conversation Like Aquarium (2:57), 09. Giraffe’s Feelings (2:44), 10. The Last Performance (1:21), 11. 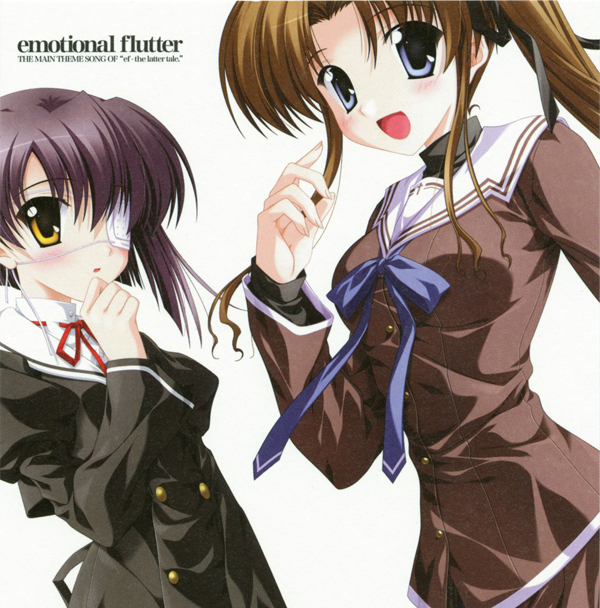 Hitomi Harada – Emotinal Flutter (4:08), 12. Girl’s Mask (2:27), 13. After School in Summer (1:41), 14. Art and Art (3:01), 15. It Dances With the Note (2:54), 16. Nostalgic Spectacle (2:14), 17. Time Spent with Friends (2:25), 18. Word that doesn’t Reach (2:22), 19. The Beautiful One is Here (2:13), 20. The Black Truth (2:59), 21. Revenge in the Past (5:19), 22. It is Solved from the Chain (3:06), 23. Ringleader (2:01), 24. Myself, another (2:44), 25. The White Truth (2:36). Disco III: 01. Clam Night of Summer (4:10), 02. New Winter (3:51), 03. Winter when Summer is Expected (2:52), 04. Regained Time (3:00), 05. The Girl who doesn’t smile (1:30), 06. To Meet you Someday (3:21), 07. The Sweet World (2:05), 08. Angel’s Stairs (1:51), 09. Baby-sister Song (1:04), 10. Will (2:55), 11. Imperfect Answer (3:08), 12. First step that realizes dream (3:50), 13. A moon filled sky in Vn (2:37), 14. Secret in the world (2:19), 15. Christmas of summer (2:34), 16. Stille Nache, heilige Nacht (2:10), 17. Bouquet (3:30), 18. Hitomi Harada – Ever Forever (5:02), 19. Tenmon – Eternal Feather [Instrumental] (5:00), 20. Tenmon – Emotinal Flutter [Instrumental] (4:08), 21. 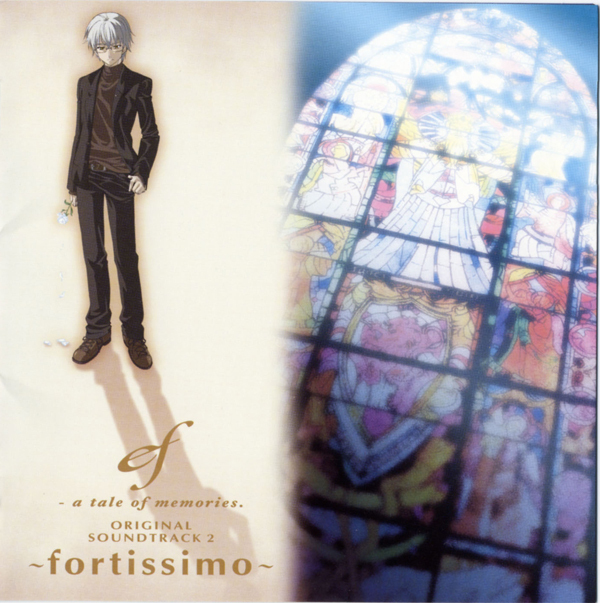 Tenmon – Ever Forever [Instrumental] (4:52). 01. Eternal Feather (4:57), 02. Eternal Feather [Movie Version] (2:22), 03. Eternal Feather [Instrumental] (4:57), 04. Eternal Feather [Movie Version] -Instrumental- (2:24), 05. Message from… (3:44), 06. Message from… (2:21). 01. Euphoric Field [Japanese Version] (3:58), 02. 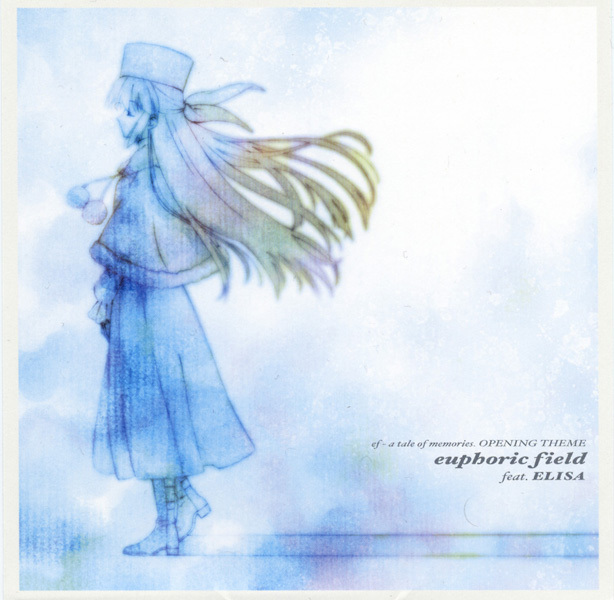 Euphoric Field [English Version] (3:58), 03. Euphoric Field [TV Version – English] (1:32), 04. Euphoric Field [Instrumental] (3:56). 01. I’m Here (4:10), 02. 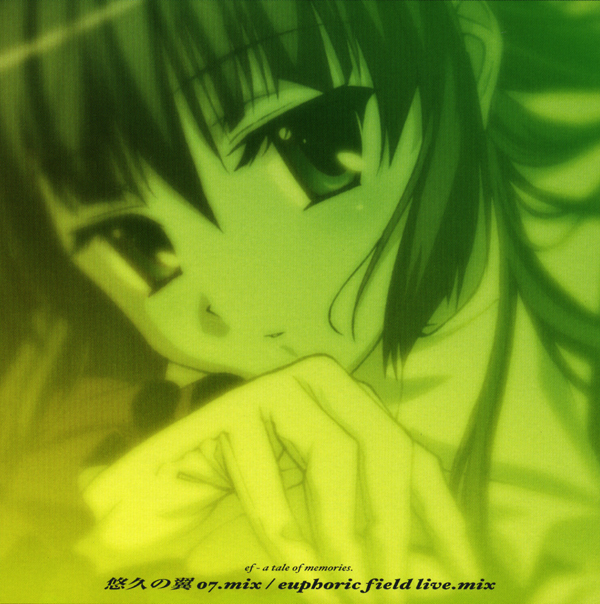 Euphoric Field [Miyako Version] (4:26), 03. I’m Here [Remix Version] (4:12), 04. I’m Here [Instrumental] (4:08). 01. Kizamu Kisetsu (3:46), 02. 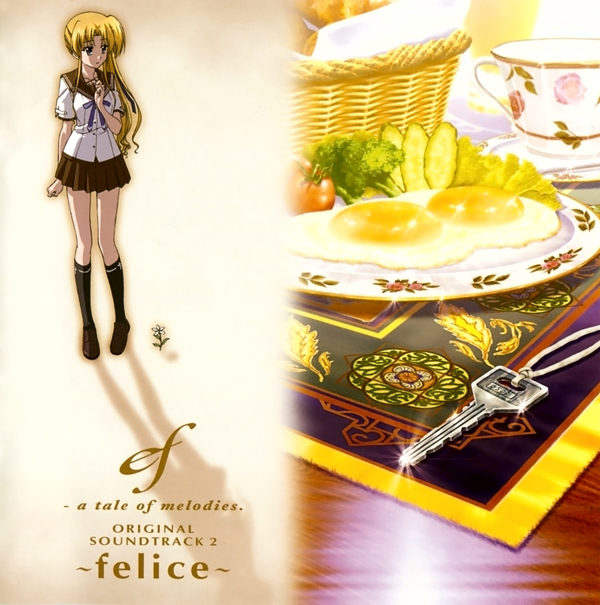 Euphoric Field [Kei Version] (3:29), 03. Kizamu Kisetsu [Remix Version] (3:19), 04. Kizamu Kisetsu [Instrumental] (3:44). 01. Sora no Yume (3:39), 02. Euphoric Field [Chihiro Version] (5:06), 03. 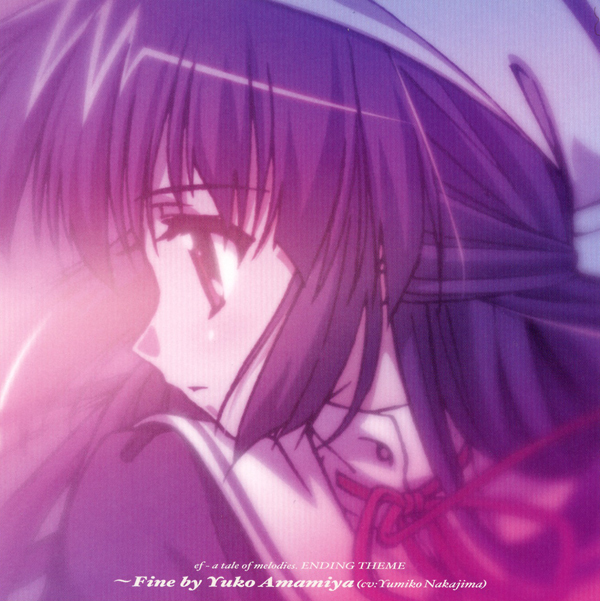 Sora no Yume [Remix Version] (4:17), 04. Sora no Yume [Instrumental] (3:36). 01. Ebullient Future [English] (3:41), 02. Ebullient Future [Japanese] (3:41), 03. Pray (4:04), 04. Ebullient Future [Instrumental] (3:41), 05. Pray [Instrumental] (4:02). 01. Emotional Flutter (4:08), 02. Ever Forever (4:53), 03. Eternal Feather (5:00), 04. Emotional Flutter [Movie Version] (1:57). 01. Egao no Chikara (4:34), 02. Ebullient Future [Mizuki Version] (3:38), 03. Egao no Chikara [Remix Version] (3:59), 04. Egao no Chikara [Instrumental] (4:30). 01. Negai no Kakera (3:39), 02. Ebullient Future [Yuko Version] (5:19), 03. Negai no Kakera [Remix Version] (4:00), 04. Negai no Kakera [Instrumental] (3:36), 05. Yuukyuu no Tsubasa [07.Mix] (4:40). 01. Elisa – Euphoric Field Live.Mix (4:42), 02. Hiroko T. & Junko O. & Natsumi Y. – Three Arrows NSR (5:33), 03. Tenmo & Eiichiro Yanagi – Yuukyuu no Tsubasa [07.Mix] -Instrumental- (4:38).